TC Electronic has done it again! Last year, they brought to the world the concept of “Toneprints”: pedals that could be “reconfigured” to sound like other pedals by uploading new profiles from your computer. Then they improved on the system by allowing musicians to upload toneprints directly from their phone to their pedals through their guitar pickups. I have reviewed and demoed the Flashback Delay and like a lot of other guys (and girls), it got me thinking about how this pedal could be even better. 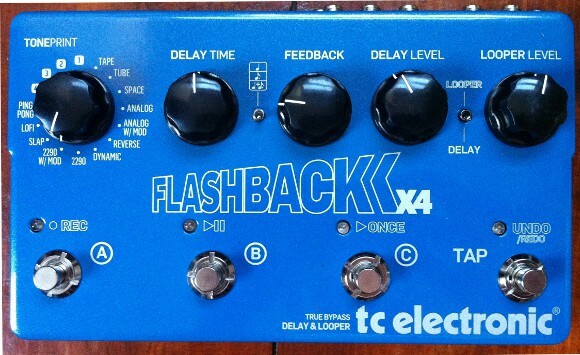 It seems TC Electronic has been thinking about it too and the result is the Flashback X4 which is like a Flashback Delay on steroids. It has absolutely killer tones and is packed with control options: 4 footswitches, MIDI input and thru to integrate into complex systems and expression pedal input to control several parameters. The Flashback X4 is fairly big, kind of like 4 Flashback delays put together. It comes with its own power supply but can also be powered by a regular BOSS style adapter. The Gator 8 supply that comes with my pedal board could power it without issues. The X4 has got 5 big rotary knobs: Delay, Level, Feedback, Mode and Looper level. The first three are the usual suspects found in a delay pedal. The second one selects the mode while the last one is dedicated to the looper mode. A mini switch toggles between delay and looper mode. Before you ask, the delay can stay on when you switch to looper mode, and that’s really cool. Another toggle switch allows for straight repetitions, 8th or dotted eighth (A.K.A. the U2 delay). It’s got mono and stereo inputs and outputs but can operate in mono of course. In delay mode the first three are for switching between different presets. To memorize the current delay settings into one of the three presets, just hold a footswitch down for a few seconds. Very handy to keep three of your favorite delay settings. The fourth switch is a Tap Tempo switch which will set the delay time according to how fast you tap on it. Using the expression pedal input, you can control the delay time, feedback level or delay level. There is also a MIDI in and a MIDI thru, handy for tempo synchronization with other MIDI devices (or a sequencer) as well as preset selection. Because TC is full of surprises, you will find two small switches (aka “dip” switches) if you remove the back-plate of the X4. You can use those to go from “Tru Bypass” to “Buffered Bypass” or even have no dry signal at all. Space: a Roland Space Echo simulation, ah reminds me of the 80s! Dynamic: in this mode, the delay is only heard when you stop playing. The idea is that if you play a fast lick, you might not want the delay to interfere. It might seems strange but it can be really useful. Lofi: it’s a mode where the repetitions are really dirty if this is your kind of thing. 4 toneprints: there are four toneprint settings for which you can download “profiles” through your phone or from the TC Electronic Website. The looper mode is highly effective thanks to the four footswitches. Press the left one and recording begins, press again and what you have just recorded will start looping. You can press again (and again) on “record” to layer recordings. It you don’t like your last recording, just press the fourth footswitch in order to undo it. The second switch will stop the loop and let it resume whereas the third switch will play the loop just once (quite handy to do a nice ending for instance). What struck me when I plugged the X4 is the sound quality: it is outstanding. Not just “clean digital” in a cold way but really hi-fi in a good way. It totally respects the tone of your guitar and your amp, adding a beautiful effect to it. To me, the control capabilities, the presets or the four footswitches are really cool bonuses but really, the tones coming out of this delay are enough to justify owning it. DId I mention I could play with the 2290+Mod for ever? So what’s next for TC Electronic? I don’t know but it sure will be exciting!